Mayor Bill de Blasio’s plan to open four new jails as replacements for the Rikers Island complex has officially entered the public review process. 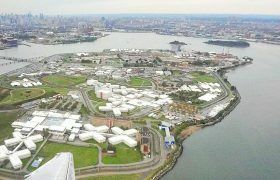 The City Planning Commission on Tuesday certified the Uniform Land Use Review Procedure application from the city’s corrections department to open new facilities in the Bronx, Brooklyn, Manhattan, and Queens as part of the city’s 10-year plan to close Rikers. The rubber stamp from the CPC comes after the project’s draft environmental impact statement, which was released last week, found no significant adverse impacts. On Wednesday, city officials announced that plans to build a 40-floor high-rise detention center at 80 Centre Street will not be moving forward, reports the Daily News. 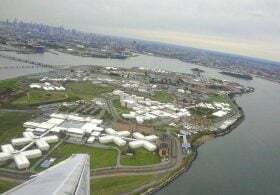 The site had been proposed earlier this year as part of a plan to close the jail at Rikers Island and relocate the inmate population to four local jails spread throughout the boroughs. 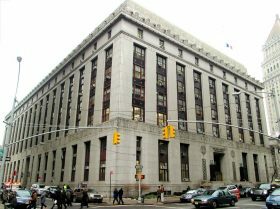 The de Blasio administration cited logistical challenges associated with moving the current tenants, which include the Manhattan Marriage Bureau and offices of the Manhattan District Attorney, as reason for the decision. Four new borough-based jails have been proposed for New York City as part of a plan to close Rikers Island, Mayor Bill de Blasio announced on Wednesday. The proposed facilities, which include building sites in the Bronx, Brooklyn, Manhattan and Queens, will contain about 1,500 beds each and offer on-site support services. The new jails would include space for educational programming, recreation, therapeutic services and staff parking. There will also be community facilities and street-level retail space, providing amenities to the surrounding neighborhood. New York City has awarded architecture firm Perkins Eastman a $7.6 million contract to study where to build jails that would eventually replace those on Rikers Island, the Wall Street Journal reported. The firm will have ten months to propose locations for new jails while looking into whether existing jails could be expanded. Mayor Bill de Blasio in June released his plan to close Rikers over the next ten years, focusing first on significantly lowering the number of inmates. Speaker Melissa Mark-Viverito and the Independent Commission on New York City Criminal Justice, along with the Van Alen Institute, released a set of guidelines to decentralize Rikers Island and improve city jails in every borough. The “Justice in Design” report outlines recommendations for healthier jails, including interior and exterior design elements, greater amenities, and ways to better integrate the jail with the surrounding neighborhood. 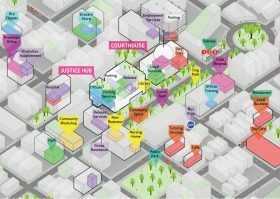 As one of the first steps to permanently closing Rikers, these new justice hubs, or decentralized borough-based jails, would be tailored to the needs of detainees, officers, lawyers, visitors and community members. In April, Mayor de Blasio announced his support of closing the jail complex on Rikers Island after protests and calls from activists and public officials. In a proposal released Thursday, the mayor says closing Rikers will take at least ten years and will require a big decline in the number of inmates there, a drop in crime rates and significant funding. As the New York Times reported, according to the city’s 51-page report, in order to close Rikers within a decade, the population at the complex needs to drop to 5,000. Currently, the daily population is about 9,400, much lower than the average of 20,000 inmates the prison held during the 1990s. The past week has been full of news about Rikers Island and Mayor de Blasio’s announcement that the notorious prison will be closed and replaced with smaller facilities throughout the boroughs. 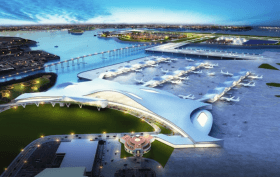 Ideas for re-use of its 413 acres have included commercial, residential and mixed-use properties; academic centers; sports and recreation facilities; a convention center; or an expansion of nearby LaGuardia airport. 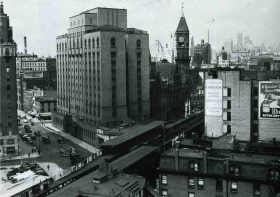 And while anything final is estimated to be a decade away, this isn’t the first prison in NYC to be adaptively reused. From a health spa to a production studio to a housing development, 6sqft explores the new lives of seven past prisons.